/ Is Muay Thai or Dutch Kickboxing Better? MMA Life has previously distinguished the difference between Muay Thai and Dutch kickboxing in the article titled “Should I Take Kickboxing or Muay Thai.” The content here will examine these martial arts in action and break down the effectiveness of each style. Furthermore, we will briefly describe the benefits they have towards mixed martial arts (MMA). As a note, Dutch kickboxing will be simply referred to as kickboxing throughout. Muay Thai fighters utilize an upright posture where they shift their weight towards their rear leg and are lighter on their lead leg. This fighting stance grants them the ability to quickly lift the lead leg to check kicks or to perform a teep, which is commonly known as a front push kick. The teep is an essential part of any Muay Thai practitioner’s arsenal. Teeps to the body will sap the opponent’s energy and break the opponent’s breathing pattern. It also affects the opponent’s rhythm to release combinations. The video below illustrate how it can be effectively used in combat by a Muay Thai Superstar named Buakaw. For this video, Buakaw is fighting Nieky Holzken in the K1 World Finals. Buakaw is using the teep to stop Nieky’s forward movement. A popular striking combination with Muay Thai fighters is the jab and teep combo where they will switch between these two techniques to control distance. If a kickboxer gets within their kicking range, a jab will not only create the space needed for a teep, but it also draws the opponent’s eyes towards it. As a result, the kickboxer’s midsection will be exposed. After back to back teeps, Buakaw feint a third one which caused Nieky to freeze and brace for it. This action permitted Buakaw to cut the distance go for a knee strike attempt. Buakaw frequent use of the teep distracted his opponent and allowed him to set up different striking combinations. Muay Thai fighters do not rely on head movement to dodge strikes as much as boxers and kickboxers. Instead, they form a defensive frame with their arm to block incoming shots. To block punches, Muay Thai fighters will alternate between the high guard and the long guard. The video above illustrates an instance of the long guard defense being effectively used. It starts off with Buakaw using the teep as an immediate counter to Nieky’s jab. Buakaw then pressured forward and use his long guard as Nieky unloads a rear uppercut. Buakaw’s rear hand blocked the uppercut while his lead arm jammed Nieky and dissuade him from further action. In Muay Thai competitions, this stiff arm to the face is great for creating space and removing oneself from clinching and elbow range. Striking from the clinch is a means to maximize the damage inflicted on opponents in close vicinity with knees and elbows. 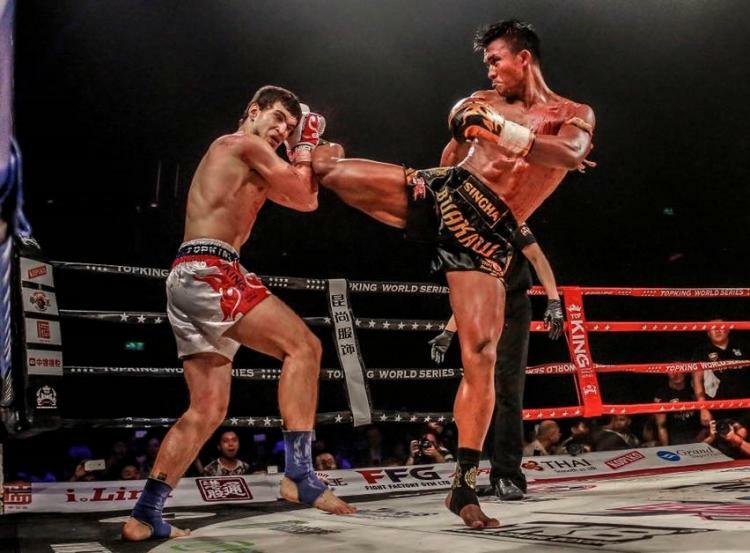 Unlike traditional Muay Thai rules, the K-1 event rules prevented Buakaw from throwing elbows and more than a singular strike from the clinching exchange. The video above displays one important aspect of Muay Thai fighting tactics in the form of a knee strike. Not only did Buakaw obtain head control and break his opponent’s posture with the Thai plum grip, he also used it to lead Nieky right into his knee. Due to competition rules that prohibits fighters from using any lifting motion to take the opponent down, Muay Thai fighters utilizes a series of leg and foot sweeps to complete this task. Additionally, Muay Thai takedowns are simple and effective off-balancing movements that can take advantage of openings created by the opponent and use their momentum against them. One example of a common takedown technique is shown in the video where Buakaw catches his opponent’s teep attempt and proceed to kick out their base leg while he frames and pushes their head in the opposite direction. In kickboxing, throwing an elbow is illegal and the refs will quickly separate clinch attempts. Therefore, kickboxers are not as developed in these skills. As a result, they have sharpen the tool sets available to them. A routine striking drill performed in kickboxing class consists of the practitioner throwing a series of punches and ending the combination with a kick. The GIF above demonstrate the potency of this combo with Nieky Holzken starting off his striking combinations with a right and left hook and ending it by chopping his opponent’s leg. The power and viciousness of Nieky’s kick threw Buakaw’s leg out from under him and prevent any chance for Buakaw to counter with strikes of his own. This is another GIF courtesy of Nieky Holzken and his fight with Joe Valtellini. It demonstrates how kickboxers like Nieky are highly competent with their punching ability and how it is heavily incorporated into their striking game. Watch how Nieky begins by throwing a body punch in an attempt to draw Joe’s hands down before throwing strikes to the head. Joe did not fall for it and kept his high guard to block the following punches. As the video continues, you see that Nieky continued to pressure forward and brilliantly counter with a left hook when Joe tried to hit him with a right hand. This example shows how a kickboxer can take advantage of the opening created when the opponent is on the offensive. Kickboxers do adopt the Muay Thai stance, especially as a defensive structure, but you can also find them being more light footed and nimble during their match. The video displays the contrasting movement between Andy Souwer and Buakaw. While Buakaw is rhythmically marching forward, Andy is bouncing on the ball of his feet. Andy’s style of movement allows him to be more mobile and explosive, which greatly benefits fighters that likes to blitz in and out of range. In Mohamed Khamal’s bout with Andy Souwer, he demonstrated how a dynamic kickboxer can attack their opponent. Mohamed was able to back Andy against the rope and patiently picked him apart with a gorgeous striking combination. As shown above, Mohamed blended his striking with slick footwork as he switched stances and struck at different angles. He then proceeded to end his striking sequence with a kick. To transfer between these martial arts, practitioner of each respective martial arts require specific adaptations. Most would agree that a Muay Thai practitioner would have an easier time transitioning to a kickboxing format because they would only be stripping techniques available to them and refining particular parts of their offensive game, such as their punches and kicks. On the other hand, kickboxers would be completely new to elbow strikes and would not be as experienced with clinching and taking the opponent down. Muay Thai and kickboxing champions like Joanna Jedrzejczyk and Alistair Overeem have found great success in MMA. Additionally, they have shown how their striking background can be used to dominate the competition. Both kickboxing and Muay Thai has its own benefits and disadvantages for MMA. Muay Thai clinches are great for against the cage offensive attacks. You can use the cage to pin the opponent before releasing a barrage of elbows and knee strikes. Due to the clinch, takedowns and strikes available in Muay Thai, a practitioner of this martial art has a skillset that is already more adapted to the offensive portion of MMA. However, the Muay Thai stance is not ideal for MMA and will require some modifications since it makes the fighter more prone to get taken down. Even though kickboxers may not throw as many knee strikes as a Muay Thai practitioner because of the catch and release rules dictated in various kickboxing organizations, it does not mean that they cannot transfer this skill to MMA. Alistair Overeem is an exceptional example of this since he has dropped many of his opponents with knees to the body and head. Kickboxers have great experience being mobile and using light-footed movements to set up their attack and exit out of harm. Kickboxing movements are good for moving out of range and the nimbleness helps fighters react better against wrestling shots than if they stood in the traditional Muay Thai stance. Both Dutch kickboxing and Muay Thai are fantastic martial arts for developing your striking skills. The videos throughout this article provides visual representations to support the effectiveness of these two style of fighting in actual combat scenarios. Hopefully, the brief glimpse inside these martial arts will inspire you to find a gym nearby and start training. That is, if you have not done so already. If you enjoy less restriction on what you can do, Muay Thai is the option for you. Otherwise, choose kickboxing as your fighting style if you would like to have dynamic movements and fluid striking combinations.